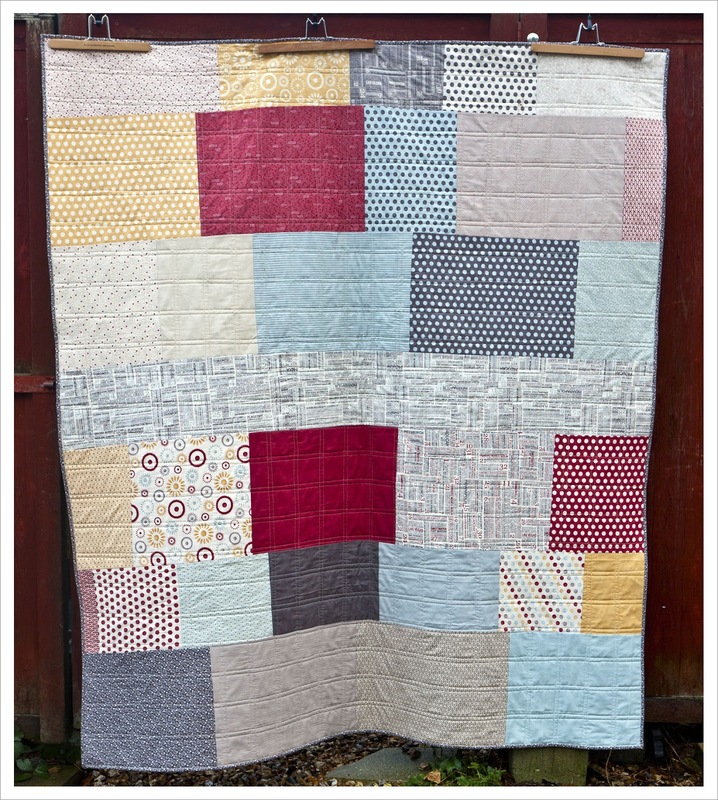 I say finally because to me it seems that I have been working on this quilt forever. But in actual fact it only appears that way. It took me a month which is long for me but then again I made a few other things in between, such as my Tova and a laptop cover and I went on holiday for a week too. Anyway the quilt is finished and I am mightily pleased with it and am fairly certain that my godmother will love it. 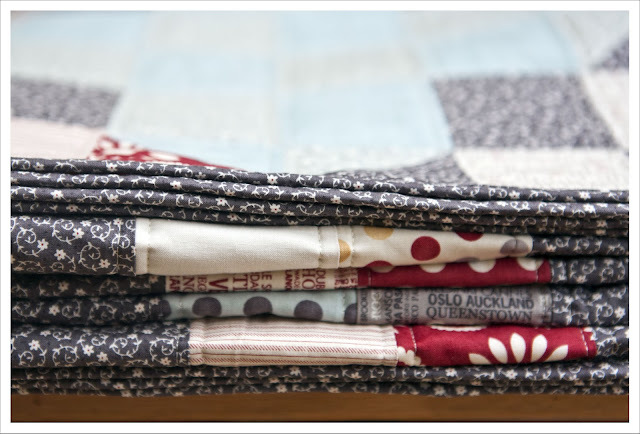 Just to recap, the quilt pattern is 'Botanical Gardens' from Sarah Fieldke's book 'Quilting from little things' . The blocks are set on point and use basically always two contrasting fabrics which was perfect for my stash of Hometown. I kept the quilting simple because although this is a quilt of subtle colours it is nonetheless a busy one. So I quilted in straight lines right and left of the seam lines. Originally I had in mind to add a diagonal along the individual blocks but eventually abandoned this idea and I think that was the right decision. The entire quilt is made of the Hometown collection. I used every last scrap of it. The quilt measures around 65 to 75" which makes it a perfect sofa quilt. The original quilt in the book was square and had a border. The back is just a more or less random selection of leftover fabric pieced together. As mentioned in my earlier posts I did not follow the piecing instructions from the book which suggested to piece in rows. I think this is not very wise and will lead to countless errors in my opinion. What I did is piece large sections; i.e. constructed myself "blocks" that I transferred to a piece of carton carton approximately A3 size and then sewed the pieces togheter. This worked very well and I only made one error in the whole process. 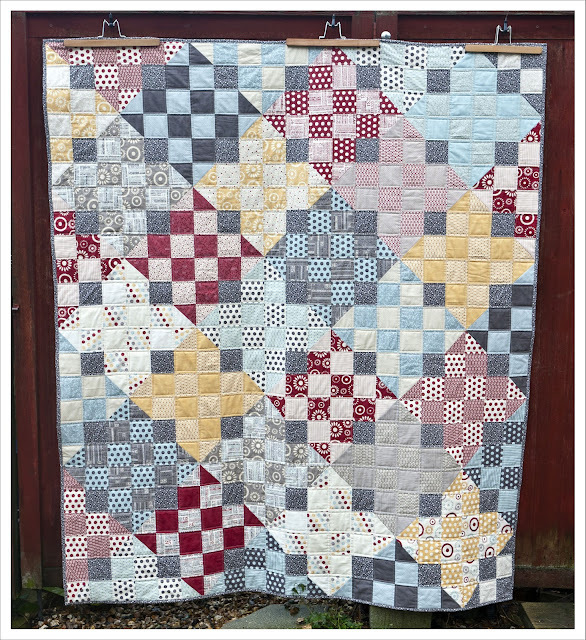 Earlier posts regarding this quilt can be found here and here. This is a lovely quilt Judith. 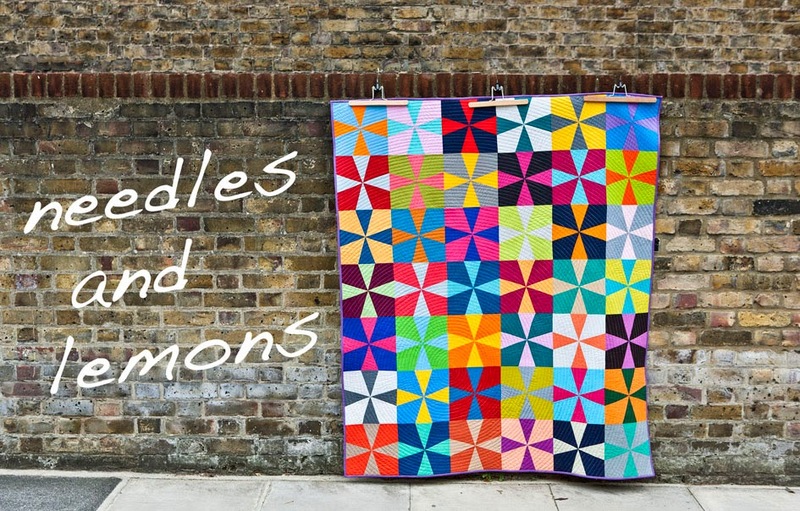 The quilting makes it even better - really eyecatching. I agree with your construction method - doing it in chunks would make more sense to my brain than row by row. I loved the sound of it when I saw your fabric choices and I love it even more now it's completed. It's my very favourite! This is a beautiful quilt Judith! I agree about the row piecing. 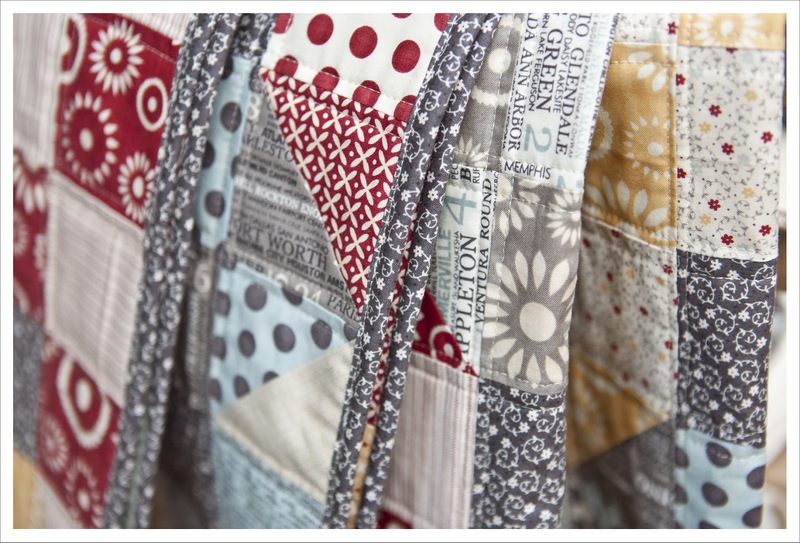 It is hard for me to imagine piecing that way as I have a lot more fun sewing the blocks one by one and then rearranging them. I see those edge squares making that more tricky but you clearly sorted it out effectively. I love these fabrics too. Great quilt! I hope Sarah fielke doesn't read your review of her pattern! I've been on the receiving end of her admonishment! Oh it has turned out so well - it will surely be loved. it's lovely and I love the hometown fabric line. It looks great Judith. I love it. 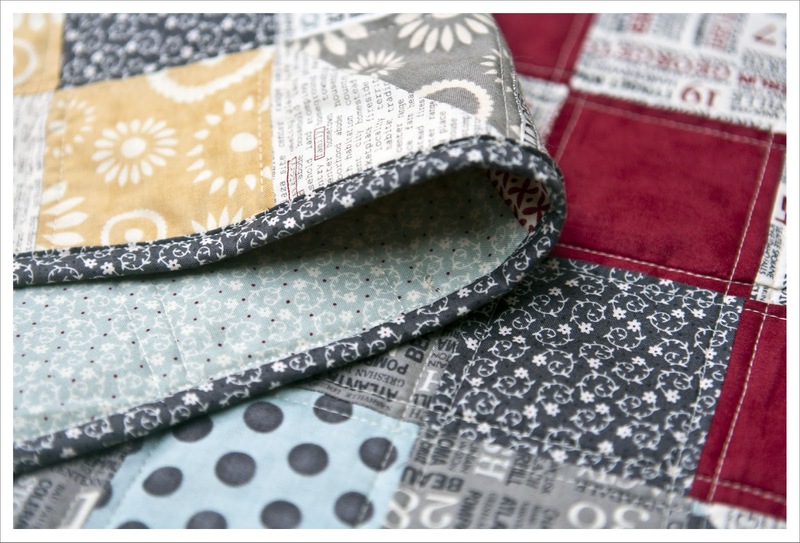 I really like the Hometown fabric and like the way it works in this pattern. You have inspired me to try it! Never knew it was in that book. It's great to see how you've used the Hometown collection- really nice to see it all used together like that. Such a beautiful quilt and with that lovely backing you've made it reversible! Oh my word you are insanely talented, it looks wonderful, well done. Love it!! This is such a great fabric line too! It is gorgeous! I have enjoyed watching your progress over the last month. Love Hometown!